This document describes how to build, display and use statistical appearance models. These tools are being made available for research/non-commercial use only. For a quick introduction to what the tools can do, look at the basic tutorial. If you're starting on a new project, look at this beginners guide. To annotate images, use am_markup start. 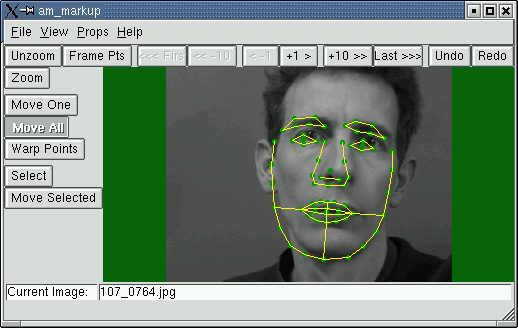 To view the shape model, use am_view_shape_model. To view the appearance model, use am_view_apm. To experiment with searching, use am_markup. To obtain parameter values from sets of annotated images, use am_get_params. To generate images for a given set of parameter values, use am_make_image. Control files and data files used by the software. The tools could not have been written without the support and contributions from many others, including Prof. Chris Taylor, current and past colleagues from ISBE and the developers and maintainers of the VXL software. Special mention should also be made to Ian Scott (who has made significant contributions to the code development, infrastructure and documentation).